A promise of a ban from the government in March; a Coalition Government in May; where does that leave circus animals? More than a year ago, ADI released video of the horrific abuse of elephants with the Great British Circus. It was business as usual – beatings, chaining and frightened animals. 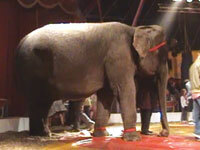 The abuse prompted the then government to launch a public consultation on the use of wild animals in circuses. In March, Defra announced the initial results of the consultation, with a staggering 94.5% of respondents backing a ban on wild animal acts. Defra Minister, Jim Fitzpatrick, announced that Labour would introduce a ban. An election was then called and by May, the Conservatives and Liberal Democrats had formed a new Coalition Government. During the General Election campaign, we contacted the political parties and every candidate, seeking their views on a ban on animal circuses. Labour, Liberal Democrats, and Greens strongly supported a ban, with the Conservatives neither supporting, nor opposing. Nick Herbert, then Shadow Secretary for Environment, Food & Rural Affairs and now a Minister at the Home Office, said, "We recognise the public concern about the use of wild animals in circuses and the issues involved. We would certainly want to address these issues if elected. …We are willing to consider the case for a complete ban and I certainly do not rule this out. At the very least, we would want to ensure a robust regulatory regime so that we can be confident that wild animals are being treated properly." Supporters can send the ADI postcard to their MP, asking them to sign this EDM. Please get supplies of our postcards for friends, family, school, college or work colleagues to the same. In July, ADI and other animal groups met with Defra’s new Parliamentary Under Secretary of State, Lord Henley. The groups reiterated the need for a ban and that regulation could not protect animals in circuses. ADI resubmitted an independent legal opinion confirming that this legal avenue is possible and pointed out that the Defra legal team had concluded last year, that a ban is legal under the Animal Welfare Act 2006. Lord Henley expressed that any action required would be based on the scientific evidence. ADI advised that a wealth of scientific evidence has already been submitted by the groups; also the flaws of the Defra Circus Working Group, which set bizarre parameters leading to the exclusion of much evidence, including that on training. It was further remarked that public opinion, ethical considerations, and empirical evidence had been the basis of much animal protection legislation. The elephants at the Great British Circus were abused by two individuals and were chained, barely able to move one step forward or backward, for 11 hours a day. While this may not have appeared in a science journal, the evidence of suffering is unequivocal and is one of many examples. Four years on from a promise of a ban made to public and parliament, the new Coalition Government has an opportunity to end this suffering and take decisive action, with massive public support.